This 6.5″ high by 9.5″ wide Plaque is intended for use by the Commemorative Monument. 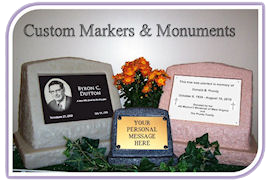 If you are ordering the Memory Monument, please go back and select the 4″ high by 6″ wide Plaque. Please display the Custom Design Guide for me. SKU: DSL. Category: Customer Designed. Dye Sublimation is a process that lets you make a colored plaque. You can have a color picture and different colors in the text and background. We can use a number of different base materials. Normally we use an aluminum plate that is then imprinted with a sublimation dye, and heat is applied to vaporize the dye, and drive it into the plate. Because the color is infused into the base material, it is also less vulnerable to fading and distortion over time. This plaque is mounted to the monument with screws and plastic caps.